When one has an extensive habit of photographing Disney parks, eventually, the challenge becomes finding new and unique angles of the same subjects. That's what the image below provides, even if it is from a Disney Resort from which I have definitely not yet exhausted camera opportunities. The Tokyo Disney Resort is built on reclaimed land east of the main heart of city, but the Tokyo Metropolitan area is still a highly dense and urban place. Though Disney takes sightlines into account for much of its parks, it can't control views of everything, especially from other elevated spaces. Thus, when I'm at the top of the Swiss Family Robinson Treehouse and look across the park, I can pick out interesting, compressed perspective views such as this! 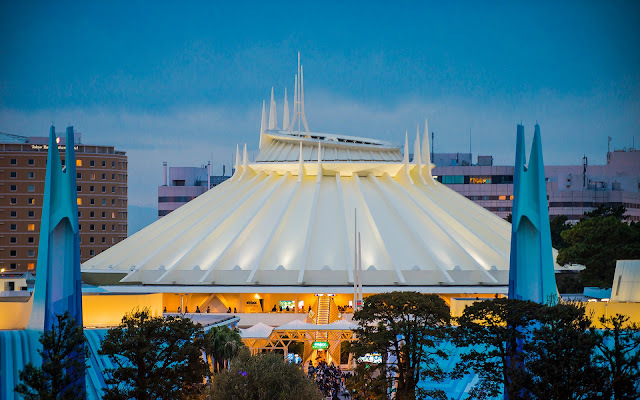 An elevated view of Tokyo Disneyland's Space Mountain from the Swiss Family Robinson Treehouse across the park shows a more city-like context for the classic ride.